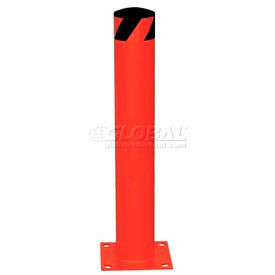 Red Steel Safety Bollards With Removable Rubber Caps Are Used For Indoor/Outdoor Protection of Personnel, Racking And Machinery. Red Steel Safety Bollards With Removable Rubber Caps are made of heavy duty welded steel with a high visibility red powder coat finish for long lasting durability. Removable cap allows bollard to be filled with concrete for extra reinforcement. Base plates include 4 openings to accept mounting bolts (sold separately). Available heights are 24", 36" and 42". Diameters are 4-1/2" and 5-1/2". Color is Red. Weights are 34 lbs, 42 lbs, 45 lbs, 50 lbs, 57 lbs and 69 lbs.